Movie reviews of films related to Chinese historical fantasy, East Asian fantasy, wuxia, martial arts, fantasy, and science fiction. 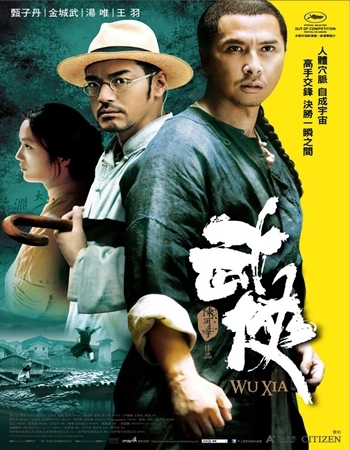 How "wuxia" is the Movie, Wu Xia (2011)? Wuxia is actually a genre of Chinese fiction centered on martial arts with a hero at the center of its story that "fights for righteousness and seeks to remove an oppressor, redress wrongs, or to bring retribution for past misdeeds." You'd never guess that based on the detective story that makes up the first half of this film. He goes on to point out that the, “The foundations of wuxia, however, are set in the early goings with references to such skills as Qinggong, Neijin and Dianxue…” But Brevet doesn’t look any deeper. And why should he, as he doesn’t have a background in the genre, citing Wikipedia as the source for his understanding. I would like to look at that issue in my consideration of Chan’s movie. If you title your movie with the name of a film genre, then you would seem to be making a statement about the content of your movie. Does Wu Xia live up to its title (it has subsequently been retitled, Dragon)? Not really. While Wikipedia’s definition is fine for causal browsing – I don’t allow Wikipedia for formal references in my university course on this genre – we can drill down a little further. Most of my readers know that the genre name wuxia is broken down into two Chinese characters: wu, which relates to martial activities and xia, which is generally recognized to represent “chivalry.” But let’s be more specific, as in the West, “chivalry” brings to mind medieval European knighthood, damsels in distress, Christianity, and “courtly love” – all of which are literally and figuratively "foreign" to the ancient Chinese concept of xia. A better translation for xia, as an ideal, would be moral integrity. Note that I write “ancient,” for modern Chinese filmmakers have changed that – but that’s a rant for the blog pages. So what specific form of "moral integrity" would suit the ideal? I would offer “altruism,” which I understand in this context to be the opposite of “selfishness,” in the sense of “thinking first of the self.” Thus, a possible translation of wuxia could be “martial altruism.” To some, who associate "marital" with mindless violence, it might sound like an oxymoron. But it is easy to understand in a global cultural context if we think of heroes like Robin Hood and, perhaps, today’s “superheroes”, like Chris Noland's Batman, who use their powers in defense of justice, etc. They are all altruistic heroes who “fight” for the “good” of humankind. With this little linguistic exercise in hand, let’s turn back to the movie Wu Xia. There is little question that the hero, Liu Jinxi (Donnie Yen’s character), is “martial,” but is he altruistic? I would suggest that besides protecting his family (which we could understand as “selfish”) there are, at most, only two instances in the movie where he places himself in harm’s way for others: 1. In the paper shop robbery, and even here, some reviewers claim that Liu is only acting out of self-defense; 2. In the village square when it is being attacked by some of the “72 Demons” gang, which was brought on by his presence in the village. So the question for me is whether the Liu Jinxi character lives up to the appellation of xia – same character as in wuxia, but used as a proper noun to describe a “hero.” If he is not a xia, then where’s the wuxia in Wu Xia? I’m not completely trying to be silly here, but am serious about how we define this genre. In the Chinese historical origins of this class of heroes, they were understood as personalities who “seeing an injustice on the road, pulls out his sword to help.” Further, early Confucian philosophers disdained them for valuing “personal freedom above family solidarity” (James Liu). In other words, in the early xia tradition altruism was an equal opportunity value – you would help anyone regardless of family ties, and sometimes, in spite of those ties. How far we’ve come story-wise where the xia are frequently involved in love affairs and family matters – sells more tickets, and keeps those Confucian values of social stability well entrenched. There was a time in the 20th century when both the Republican and Communist governments banded wuxia movies as being dangerous for the country’s morals – but in those days the film industry was partly to blame for introducing blatant sexuality into the wuxia genre – to sell more tickets. Back to our movie. 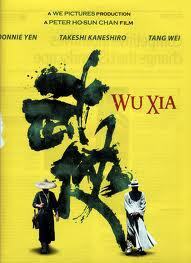 I don’t find much wuxia in Wu Xia. The character with the most appeal – storytelling-wise – is not the main character, Liu, who is rather flat, but Takeshi Kaneshiro’s intriguing constable/detective, Xu Baijiu. And he is not a xia in the sense that he uses martial techniques to help others. Rather, he uses his brains to solve crimes and sort out his own life. In this, he actually has a character arc – rare in most wuxia movies that tend to obsess with the martial aspect. Detective Xu, rightfully so, is the most interesting character in this noir mystery tale. As for the plot, a number of reviewers have pointed to David Cronenberg’s brilliant, A History of Violence as the template for the Wu Xia screenwriters. I made the “mistake” of following that clue and watching the movies back to back. It is clear that Wu Xia has A History of Violence as a model, but it is equally clear that in terms of storytelling the former can’t hold a candle to the latter. Cronenberg gives us a man and his family torn apart and stitched back together by a terrible “history of violence.” Wu Xia attempts and fails to give us the same. It fails at the storytelling level because the main character has little character, he is easily upstaged by the supporting character (detective Xu), the Lu family only gives us a shallow sense of the horror they are going through (compared to the family in A History of Violence), and the plot is so poorly conceived as to end, as reviewer James Marsh writes, “in one of the most staggeringly unnecessary examples of deus ex machina in recent memory.” Usually, when a writer has to resort to the deus ex machina “device,” it signals a lack of imagination. And that is what is so sad about such a beautifully shot movie. The camera work and genuine Yunnan settings are fresh, new, and vibrant. The idea of introducing traditional Chinese medical understandings via detective Xu (who is miles beyond Tsui Hark’s Detective Dee) is innovative, but not original – see Guy Ritchie’s Sherlock Holmes (2009), which is probably not the first to use this interior body view technique. Donnie Yen’s fight choreography is great, especially the amazing scene with Kara Hui! The use of Jimmy Wang Yu as the villain (here’s where Wu Xia has one up on A History of Violence) is brilliant – he’s also far beyond the “hero.” But once again, wuxia cinema is unable to sustain an overall coherent story – the villain seems to prove too much for the writer’s imagination. Wu Xia is not a wuxia genre movie. Rather, I see it as a stylish noir mystery. No doubt, my understanding of the genre is fairly idealistic as I feel that the fighting should express some sense of altruism, a sense of forgetting the self in the support of others – not just one’s family, which is natural to most people. And, no doubt, this is drawn from both my study and teaching in my Boston University Writing Program course, “Paradox of the Hero/Heroine in East Asian Cinema and Fiction.” Where’s the paradox? As I understand it, these wuxia heroes represent the values of selfless equality in cultures that place the family before a sense of social equality. Traditional xia values transcend the local and the familiar for the universal and the other. In this sense, the traditional xia are still relevant to our globalized world. Now all we need are writers who can give this ancient tradition a contemporary appeal – or at least, film companies that can properly title their films!